Cousins by the dozens !! 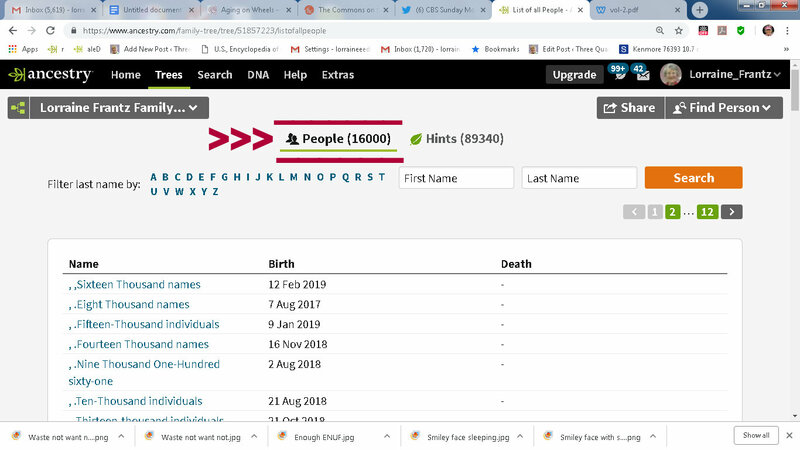 Today, I’ve been glued to the computer (and reached sixteen thousand names). One of those searches that I could not walk away from. Furthermore, I was (am) so sad for several cousins. Actually third cousins, two-times removed, but, none-the-less, some of my “Frantz family.” Honesty, my information is limited regarding one girl, in 1920 Federal Census, living in “Chicago Orphan Asylum” while her mother in “Alton State (mental) Hospital“ (Madison Illinois). Fruitless searches for her brother and sister. The father appears as a “roomer” in 1920 Census in a private home with non-family. I’ve searched hoping to find the children in the home of aunts or uncles, or grandparents. “No.” This is so strange because my Old German Baptist Brethren families are so “close-knit” and take care of family. ~~ Today’s “obsessive-compulsive” research by Lorraine. Two days ago, different research and this story. (A story for genealogy publication titled Mennonite Family History.) Oops! The “this story” link isn’t working so another project for me. ← Enough for one day ? ?